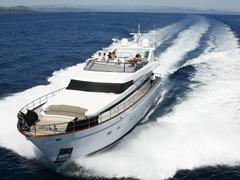 A call to Vassilis Fotilas at Fraser Yachts in Monaco confirms that he's just signed the 26.6m Akhir_ _Isabel for sale. Delivered by the Cantieri di Pisa yard in July 2006 the megayacht is, says Vassilis, is excellently presented and, unusually for a yacht this size, is fitted with zero speed stabilisers. Highly customised, she's commercially registered with an impressive charter record and is available to view in the South of France. Isabel accommodates up to nine guests in a master, VIP, double and twin with a Pullman berth and is on the market asking €2.9 million.